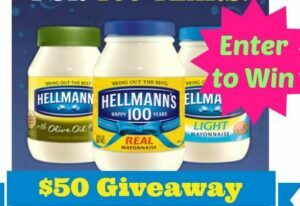 Head over here to enter the $50 Safeway Gift Card Giveaway courtesy of Hellman’s! Plus you can go here to download 20 delicious recipes from Hellmans, three of which were developed by Mario Batali. Two winners will be selected to win the giveaway. Good luck!